Muslim Advocates released a report on the tenth anniversary of passage of the USA Patriot Act. 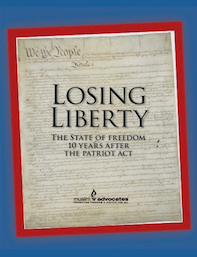 Losing Liberty: The State of American Freedom 10 Years After the Patriot Act illustrates how the law opened a new era in which federal law enforcement erodes America’s cherished freedoms and wastes precious resources. In the report, which includes a forward by former Senator Russ Feingold, Muslim Advocates sets forth concrete steps Congress and the President should take to amend the law and uphold our nation’s founding freedoms, which are guaranteed to all Americans, regardless of faith. The report offers an honest look at how the government has created and expanded unprecedented powers to spy on innocent Americans, how charitable giving has suffered because of stifling fears and confusing regulations, and ultimately, how the acceptance of religious and racial profiling has created a hostile environment and a breeding ground for anti-Muslim rhetoric and hate. In 2003, FBI Director Robert Mueller directed each of the FBI’s 56 field offices to count the number of Muslims, mosques, and Muslim-run charities in their regions. The FBI also conducted so-called “voluntary” interviews resulting in the interviews of nearly 500,000 Muslim and Arab men during the period from 2001-2005 alone. In late 2008, the FBI codified these practices by modifying its guidelines for agents to allow massive racial and ethnic data-gathering and expansive surveillance of mosques and other religious and political gatherings, without evidence of wrongdoing. Today, the FBI has 15,000 spies and informants, mainly targeting the Muslim community, and as many as 45,000 “unofficial” informants. If a donor unintentionally gives to a prohibited organization or gives to a valid charity that in turn gives to a prohibited actor, the government can freeze the assets of the good faith donor. According to a recent survey, 22% of Americans say their opinion of Islam is “not too favorable” and 35% said that it is “not favorable at all.” Furthermore, 43% of Americans admit to feeling at least “a little” prejudice toward Muslims. From 2001-2009, a report names 7 charitable organizations that have provided $42million+ to anti-Muslim organizations. While 2% of the U.S. population is Muslim, they account for 25% of the total number of discrimination complaints against employers. In a recent survey, of 78 Northern Virginia Muslim children ages 12-17, 80% reported that they had been subjected to bigoted taunts, epithets and harassment; 50% reported being called names in front of teachers and school administrators.